They are all generic ibuprofen. 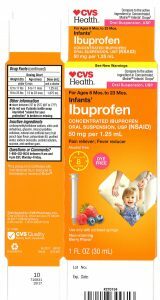 Motrin/Advil brand name infant ibuprofen is still safe for use. Equate: Infants’ Ibuprofen Concentrated Oral Suspension, USP, 50 mg per 1.25 mL, in 1.0 oz. bottle Wal-Mart Stores Inc. Product Image taken from the FDA’s website.